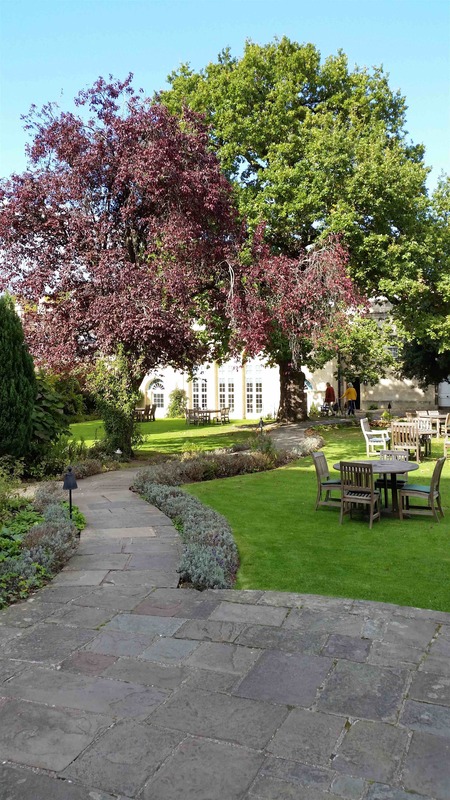 The Dower House Restaurant is a 3 AA rosette award winning establishment nestled in the secluded gardens behind the prominent Royal Crescent Hotel landmark in Bath. 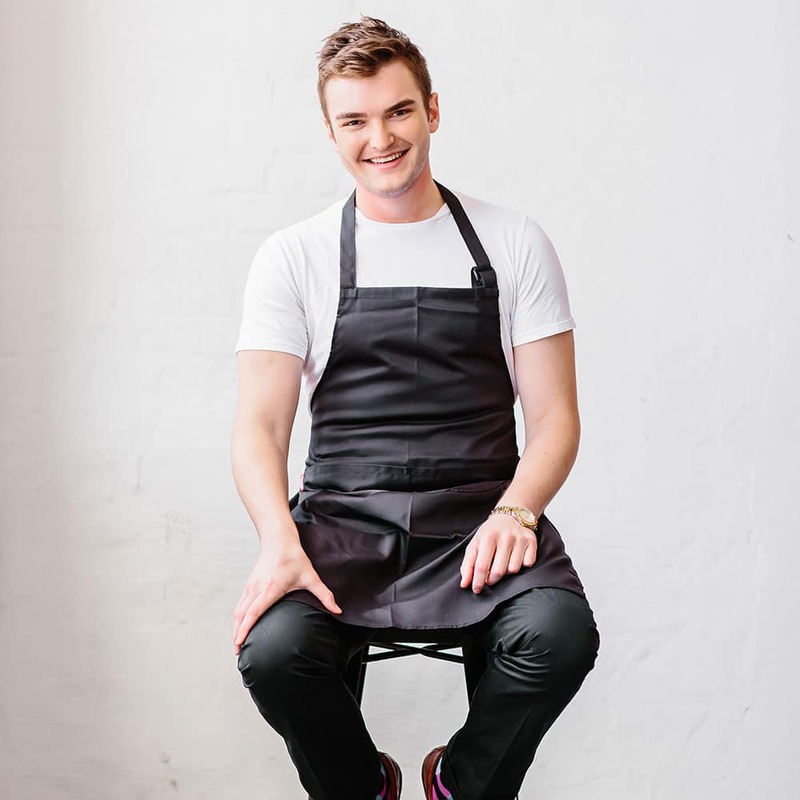 The style is classic cuisine with a contemporary twist and Head Chef David Campbell has certainly proven that he and his team are a force to be reckoned with. 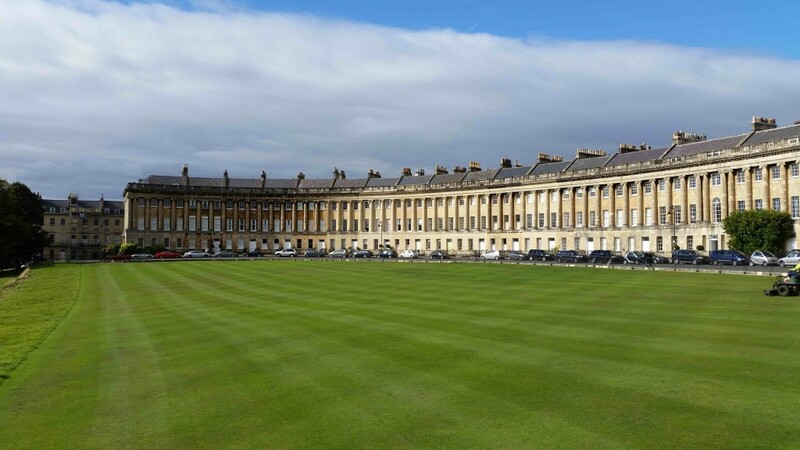 Walking through The Royal Crescent Hotel and into the hidden wonderland of the beautiful gardens behind, is a pleasant surprise and a welcome break from navigating the busy, steep streets of Bath. The restaurant is decorated in a royal blue, beige and white palette, punctuated with artwork in the form of painted branches with blue blossoms. Minimalistic tables with bright white table cloths carry a vase containing a single flower. The glassware is elegant and all the table-top accessories are expertly positioned. We were brought the menu and some locally bottled water, followed shortly by a selection of homemade breads. I chose the Irish soda bread which was flavoured with pepper and chives. After choosing our meals, we were given an amuse-bouche. 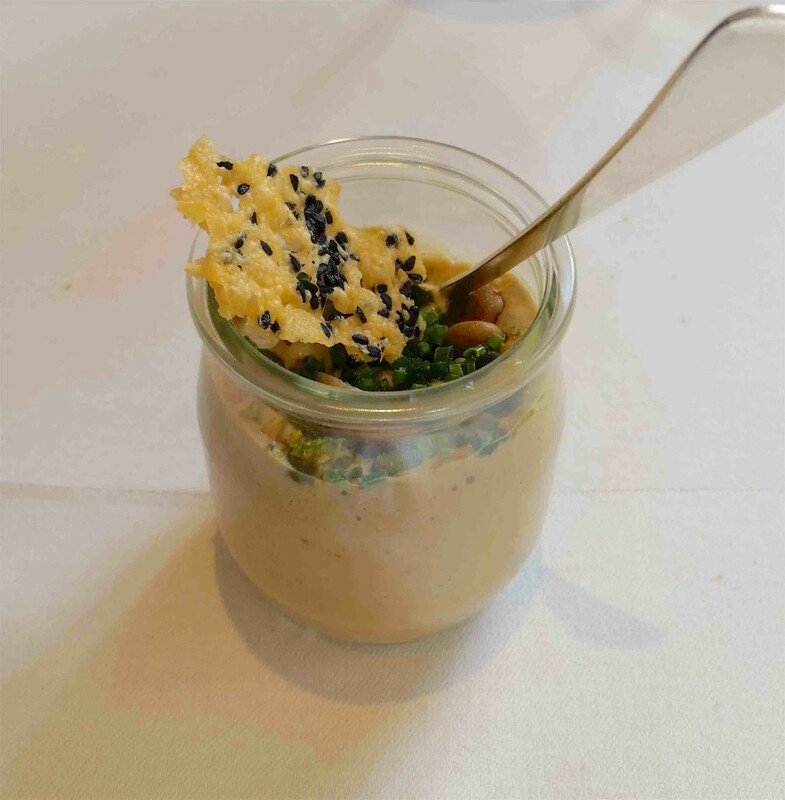 This consisted of a small jar with mushroom mousse, pickled mushrooms, chives and a parmesan crisp. The flavours were delectable and really did the job of activating one’s taste buds prior to the meal. The mushroom flavour was intense and the consistency was light and fluffy. The combined elements of the mousse, pickled mushroom and parmesan created a taste and texture sensation and I was truly sad when it finished. Jokingly, a guest from our party requested a five litre bucket of the mushroom mousse as his meal. It was that good! Our starters arrived and were a real feast for the eyes. One of us had the table-smoked trout which arrived with a glass cloche over it. Inside was a murky white smoke which was released when the dome was removed, revealing a beautifully composed trout and elements with vibrant colours and shapes. 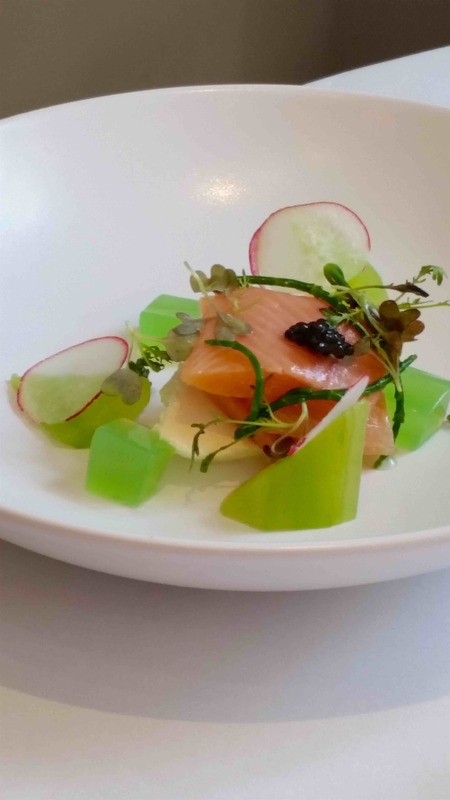 The accompaniments were variations of cucumber, horseradish, samphire and caviar. The smoke had a rich oaky aroma which flooded the table and surrounds. 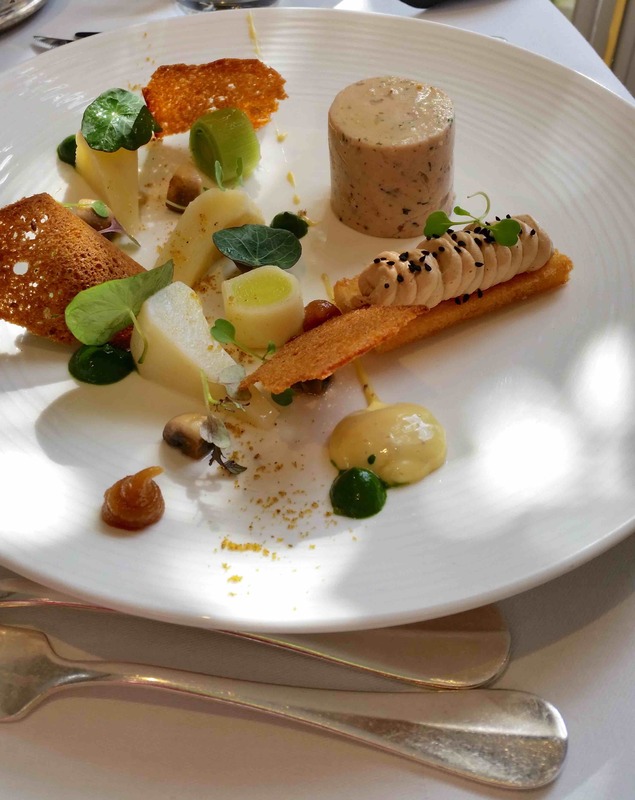 The other starter was rabbit terrine, vegetables a la Grecque, livers on toast and pistachio. It was very large for a starter and was intricately constructed to form an incredibly visually appealing dish. My starter was entitled: Duck egg at 63oc, Artichoke, Summer Truffle, Pata Negra Ham, Cep and Leek. This consisted of a sous-vide duck egg yolk cooked at 63 degrees surrounded by the other elements. Served with duck-fat bread soldiers, it created a fun, interactive dish with each mouthful tasting different to the last when combining the various items – a very clever, tasty and vibrant dish. For main course I opted for the ‘Roasted Brill, Salt Cod, Jerusalem Artichoke, Charcoal, Cockles’. The dish was presented on a beautiful grey plate with a large scoop of perfectly seasoned mashed potato adorned with the various items. The brill was well cooked and incredibly tasty, and the Jerusalem artichoke was a stunning taste and texture combination. The cockles were fresh and juicy and the thin crisps of salt cod offered a welcome variant of intense flavour to break the over-all buttery and mellow flavours of the dish. 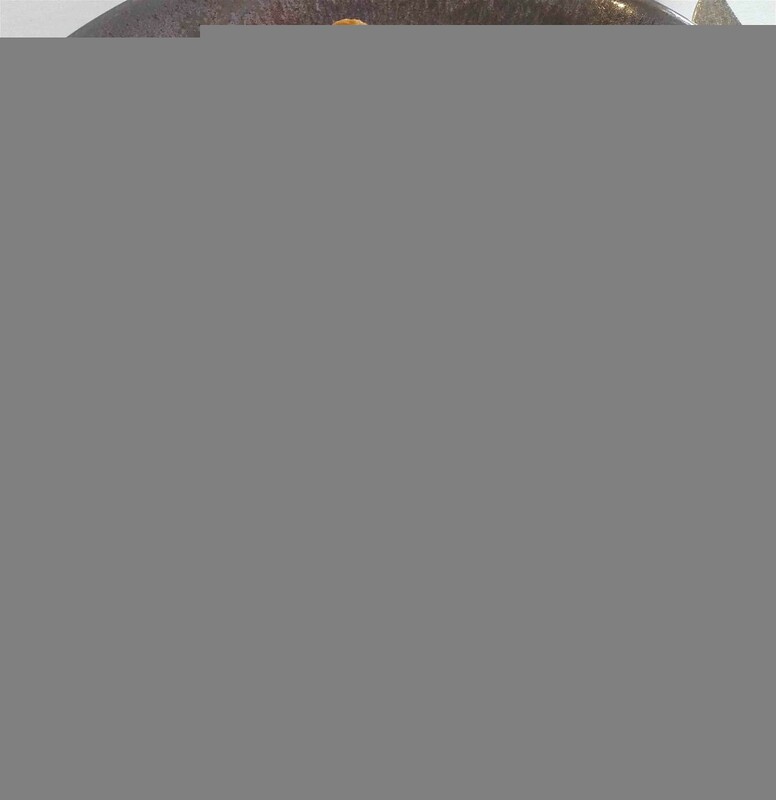 The charcoal came in the form of ‘spherified’ black blobs on the plate. The flavour of the charcoal was relatively insipid and I was left with the over-all impression that this element was included to display the Chef’s ability to perform a very skilful and impressive ability rather than add a functional element to the dish. Over-all, the dish was incredibly delicious and the elements were fresh and cooked to enhance their integrity. It was a hearty and satisfying dish and allowed one to experiment with the flavour combinations and pairings. 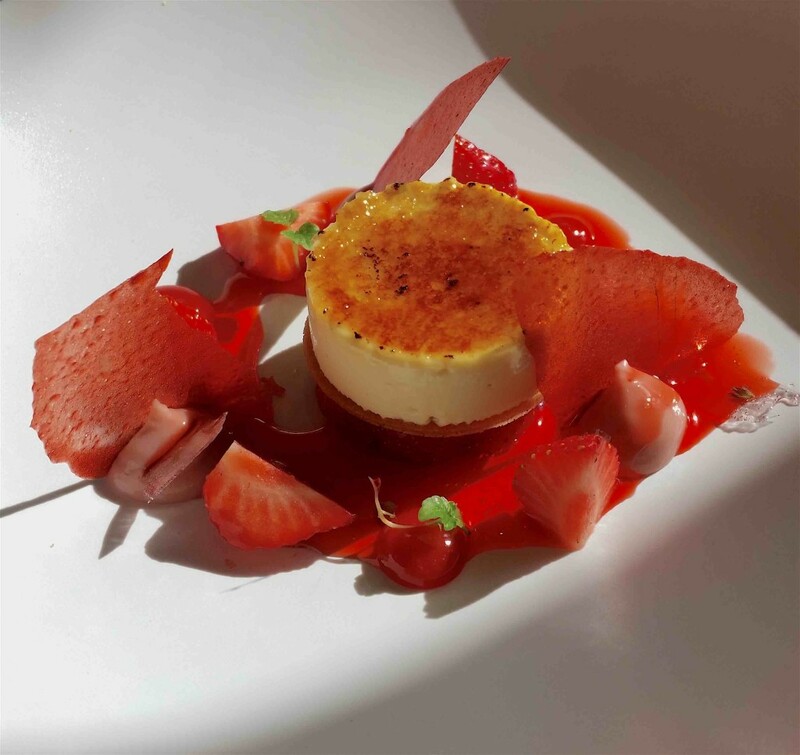 The dessert I ordered was ‘Lavender Creme Brulee, English Strawberry Salad, Strawberry Curd and Crisp, Lemon Balm’. The presentation was utterly beautiful with incredibly vibrant red strawberry variants and a nut brown circle of bruleed sugar in the centre. Underneath this was the lavender crème with a thin biscuit on top of even more fresh strawberries. The lavender flavour was subtle and didn’t have the medicinal taste that lavender flavoured desserts usually do. The strawberries were perfectly ripe and sweet and again created an interesting and entertaining dish to eat with the different styles and skills used to create the various items. The dessert certainly stood out as a fantastic dish. We ordered coffee which came with a selection of petit fours. 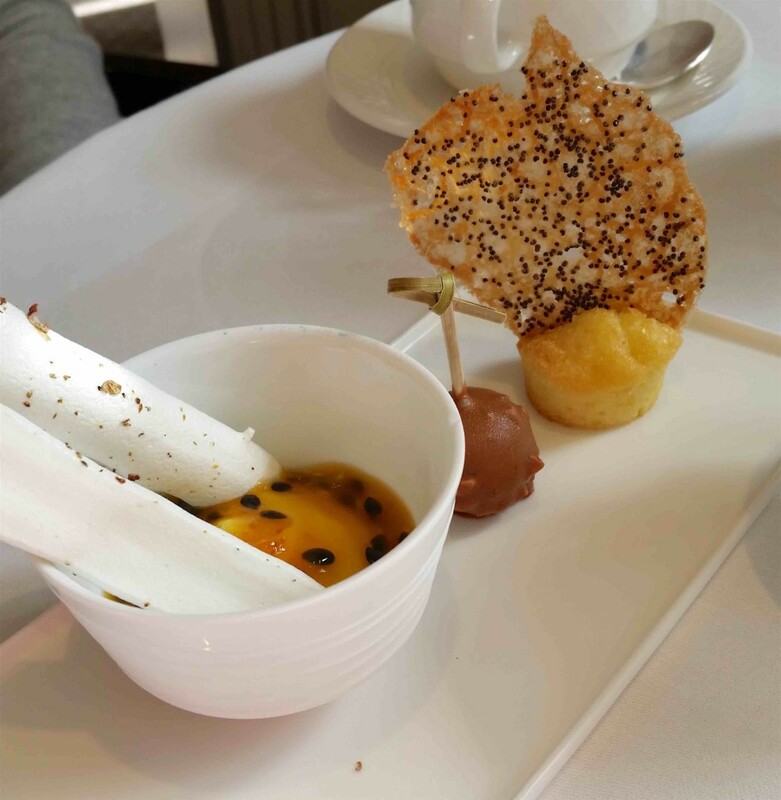 These consisted of an orange financier with poppy seed tuile, ice cream enrobed in chocolate and a granadilla curd with Szechuan pepper meringue fingers. All three where delicious and certainly did well to conclude the fantastic meal. 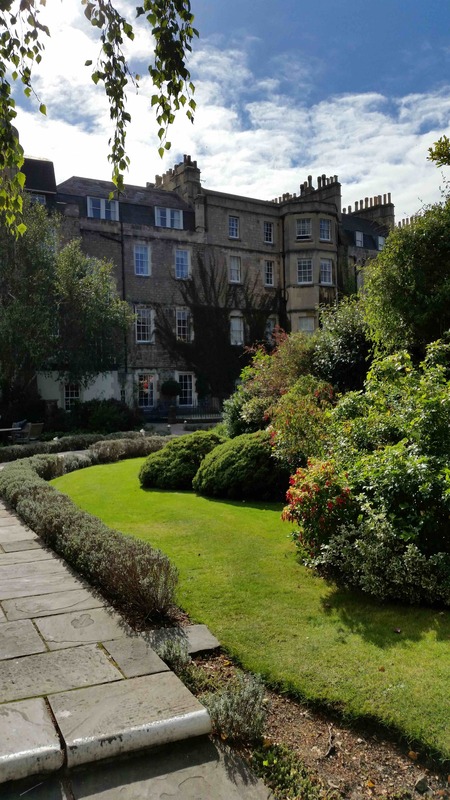 After dining at Dower House in Bath, I can safely say that I would return in a heartbeat if I were to visit the city again. The ambiance, setting, service and cuisine were all absolutely fantastic and we all felt satisfied and happy after our meal there.